Winter is almost here !! Too cold. By the way, Do You know "hizu" ? It is food. I heard it is delicious. I don't like sea-food. I want to eat "hizu" once in a life. 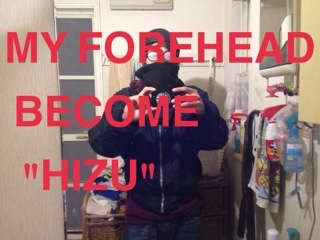 oh, "hizu" is cartilage of salmons' forehead. I usually go to school by my super cub the motorbike. It is cold these days. My knees become too cold. not "hizu". And I wear half-cap as a helmet. My forehead become too cold to stand. I think 'Wow, It is "hizu". It is what we should call "hizu" wow.